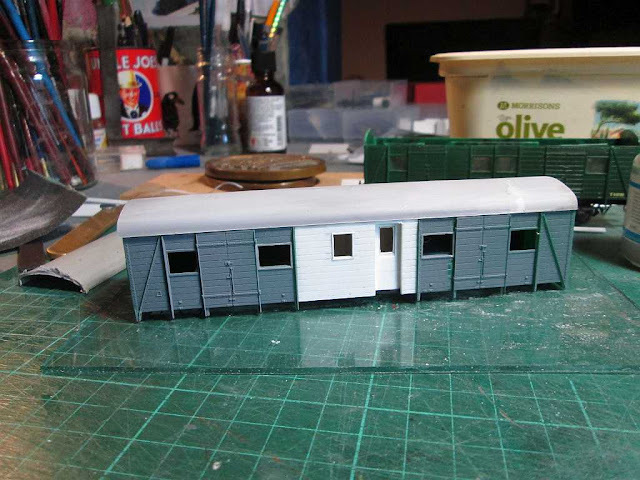 Also coming together on my garage layout the light railway shed scene. 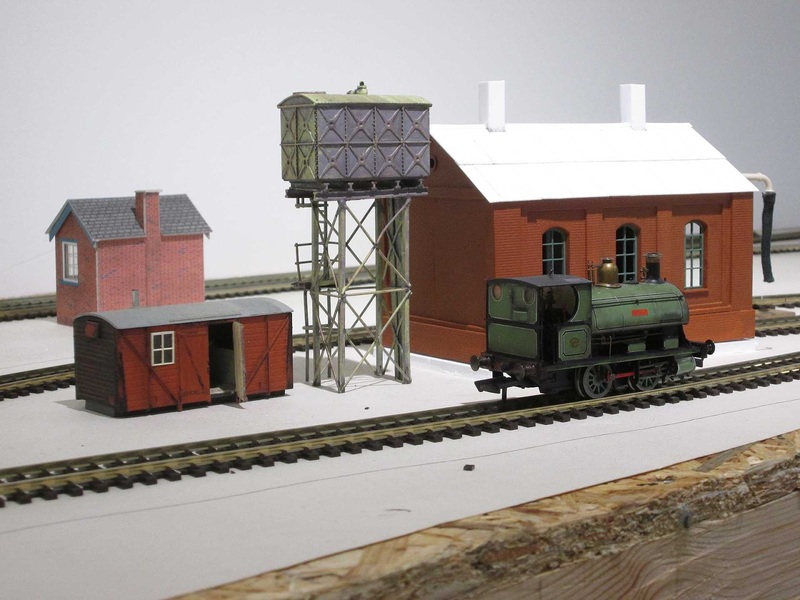 The loco shed itself is a reworked Miniart workshop kit, the water tower Bachmann and the grounded van body an old Lima one with a few tweaks by me. Another stock project but this time for my York inspired OO gauge layout in the garage. 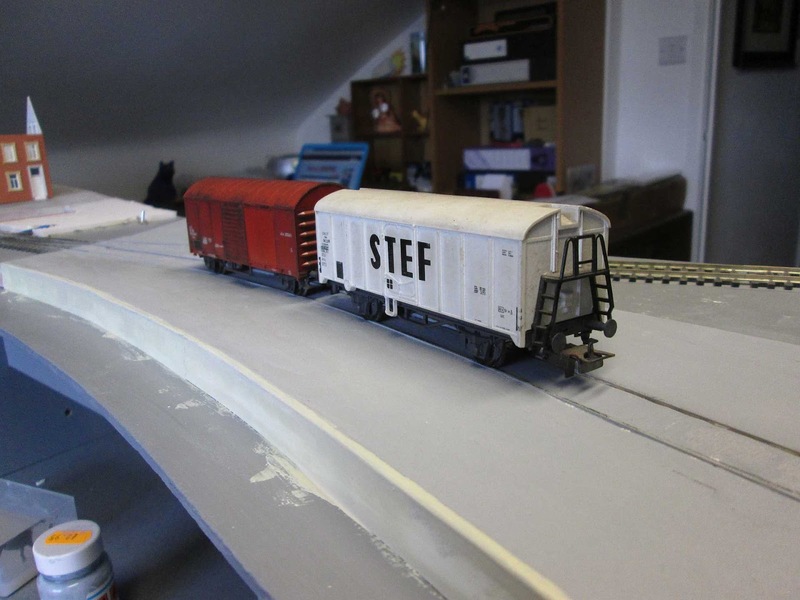 It started off as a spare rtr chassis to which I added a plastic outrigger and a big lead weight on top. 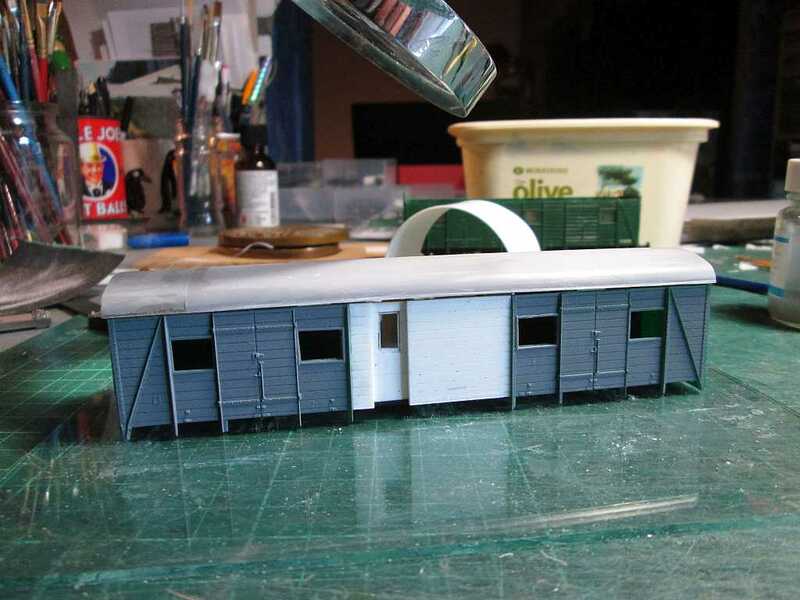 Quite obviously it's not a scale model and what's the pen sticking out from it doing? 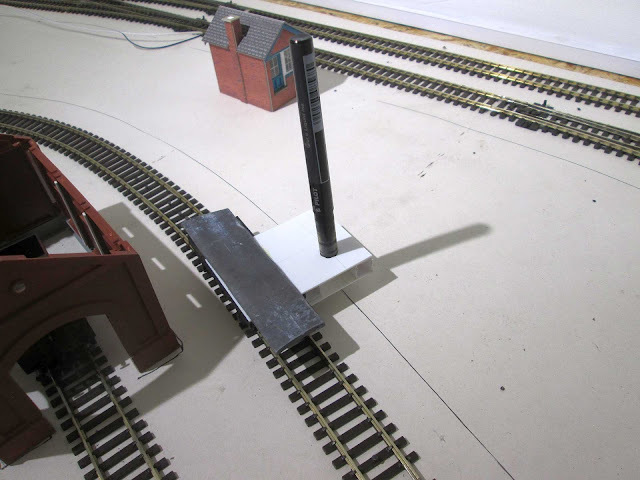 It's all to do with baseboard construction. The garage layout baseboards were built with flat tops. 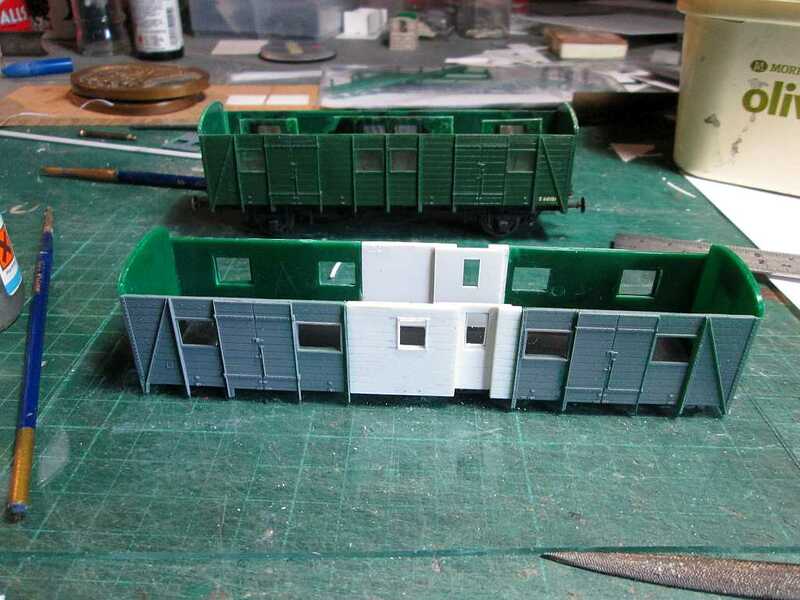 These were covered in lining paper and track temporarily pinned down and altered bit by bit until I got an arrangement that I was happy with. The outrigger is set so that the pen marks the edge of the formation according to NER standards. 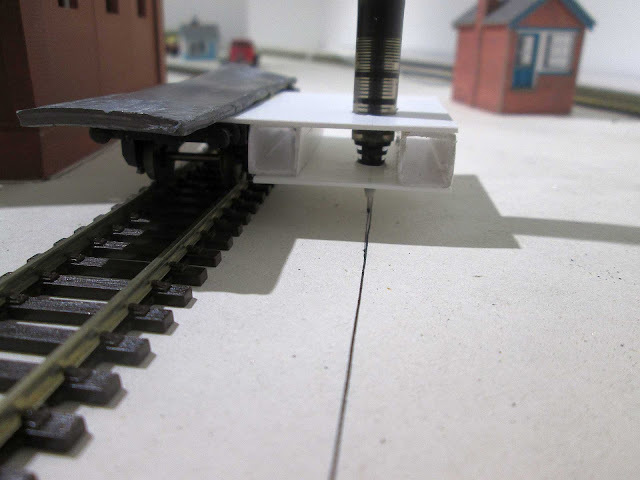 This will define the edges of the mdf sections I'll cut to enable the tracks to be raised a couple of inches above the flat deck. 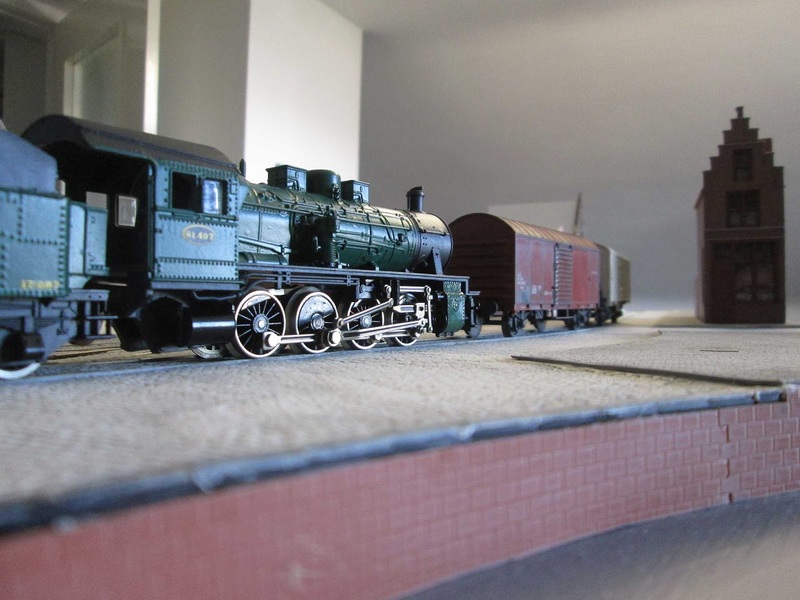 Whilst work on the layout takes places I normally have stock projects on the go too. 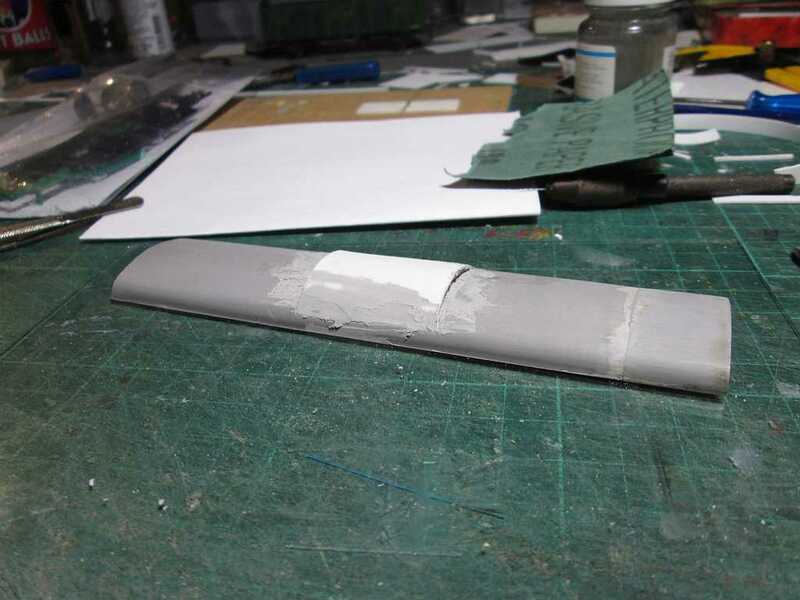 Most of what we do has a stop - start quality as paint and glue dries. These days I tend to leave longer between coats or for hardening time, so having an alternative project to go to makes sense. 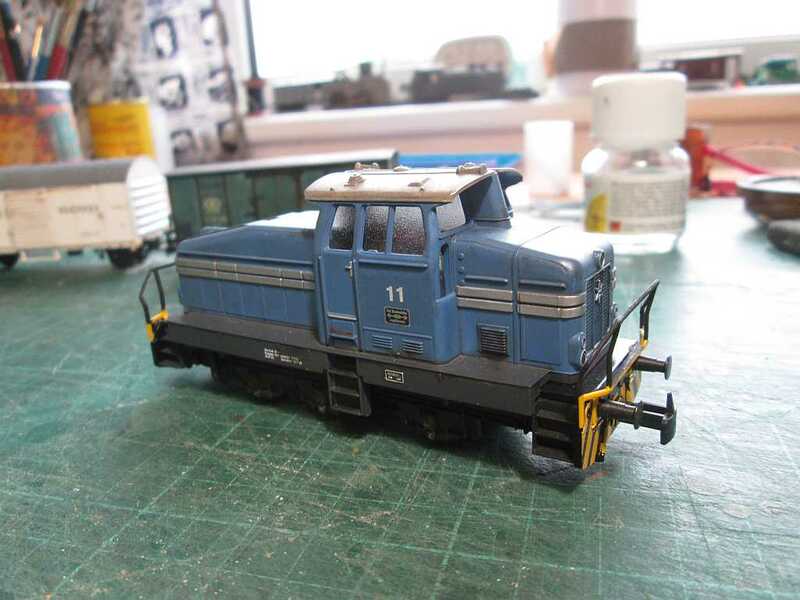 For the past few weeks I've been turning a bargain Fleischmann Swedish version of their Prussian G8 into its NMBS 81 guise. Originally it was going to be little more than a repaint but I sort of got drawn in to doing more. Seeing a little success motivates for tackling something else and the whole thing snowballs from there. 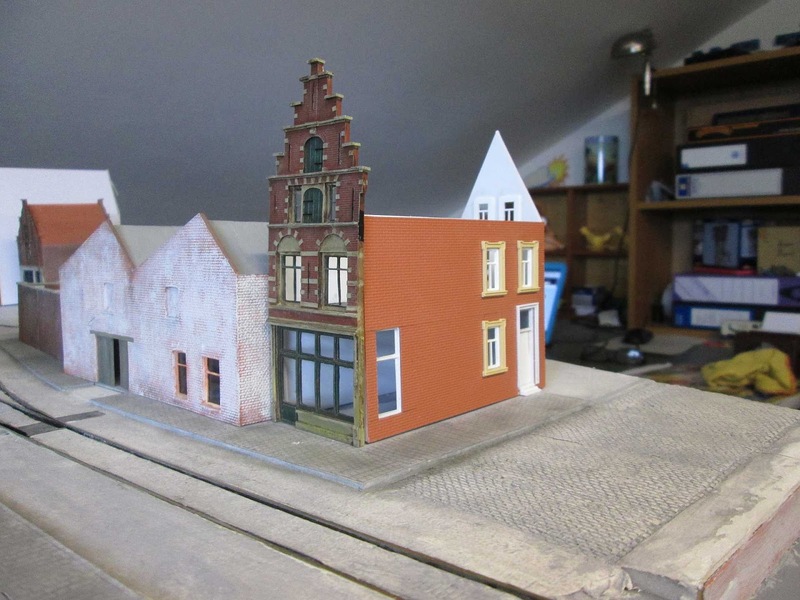 Here's the finished item sneaking across the pavé. Every cloud has one. My own silver lining is a scarily tidy playroom on account of pest control coming round to spray the upper floor of my home in order to combat a clothes moth infestation. Everything has been found a home on shelves or in cupboards except for Vischkaai's baseboards which have been moved (temporarily) downstairs. Though I could have left them in the room I didn't want to take a risk of what I'd done reacting with the chemicals used in the spraying. Though the board surface look pretty plain and unfinished I reckon that the hours put into just the surface textures will be into three figures by now. 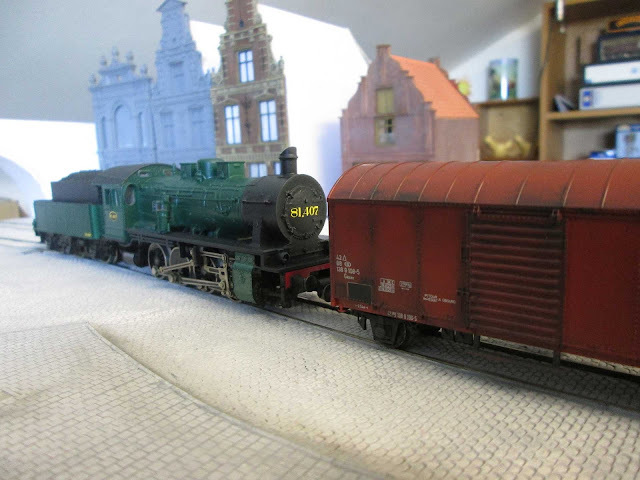 We last took a look at my toys over a year ago. It's frankly not surprising that updates are few and far between, blogs are this century's diaries and I was always rubbish at keeping up to date with diary entries. 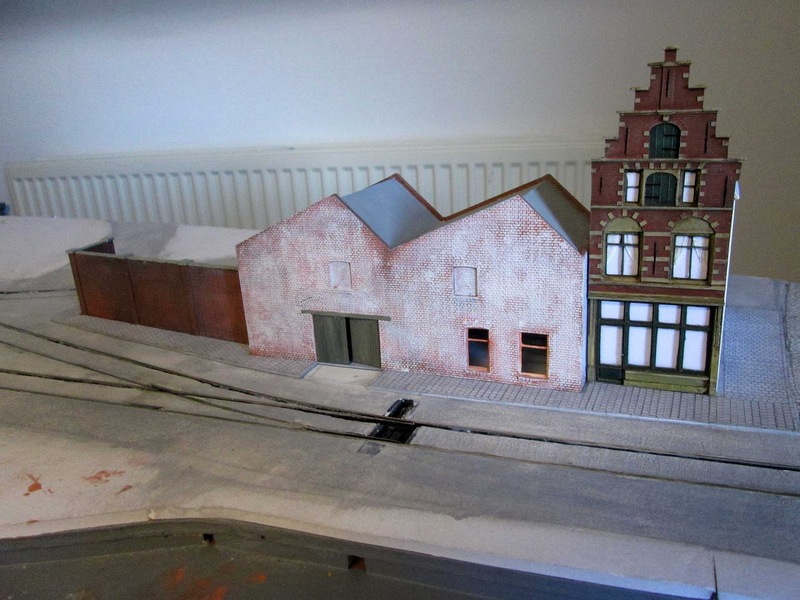 What's happened in the intervening year is that I've built, or am part way through building a Belgian layout, Vischkaai, designed to be portable with half an eye on taking it to the occasional exhibition. 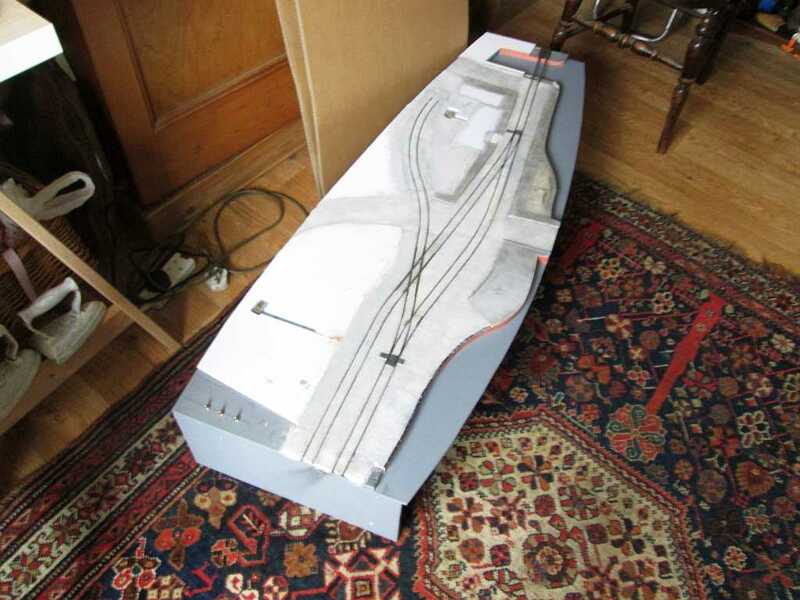 The nuts and bolts of baseboard, track, wires and landforms are done and I'm some way through the scenery. 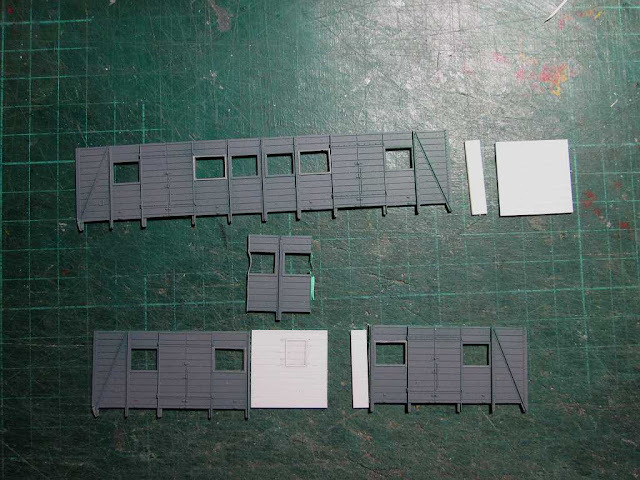 Here are a couple of reasonably current images. 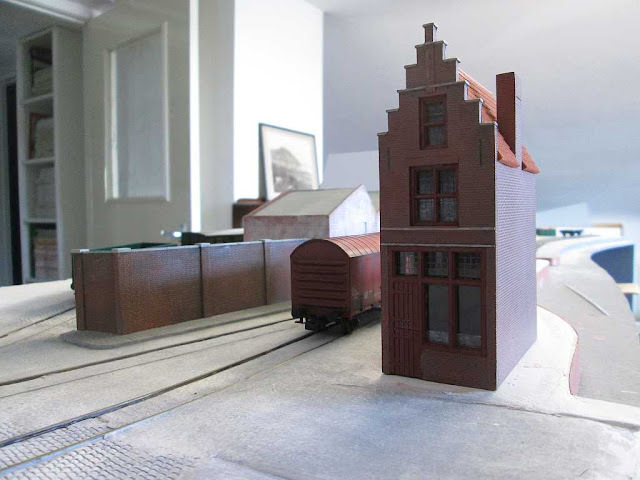 In parallel with the layout build I'm putting together a small collection of stock suitable for an industrial line winding its way through the streets to the docks. So far efforts have been directed at weathering rtr vehicles, and most satisfying it has been too. 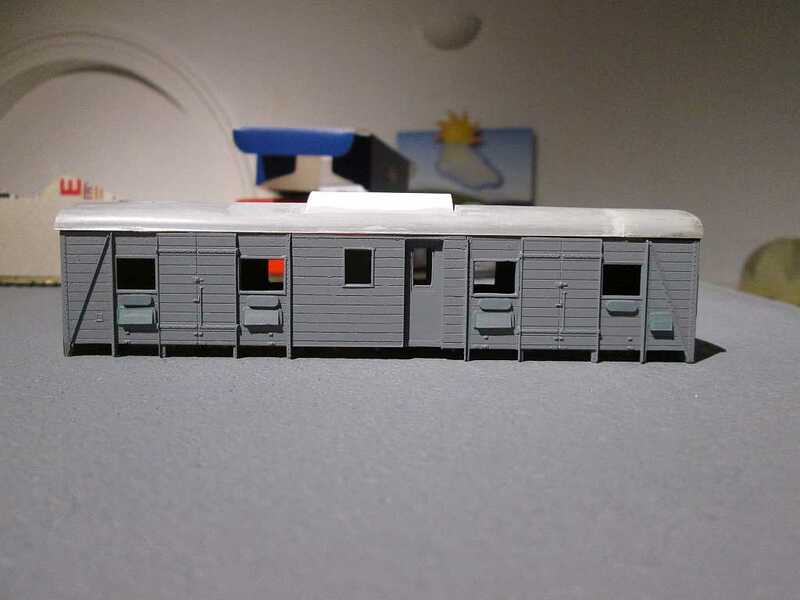 Since my last post we've moved home, not a great distance and I still have a decent sized playroom but I'm still in the unpacking phase so model making has taken a back seat. 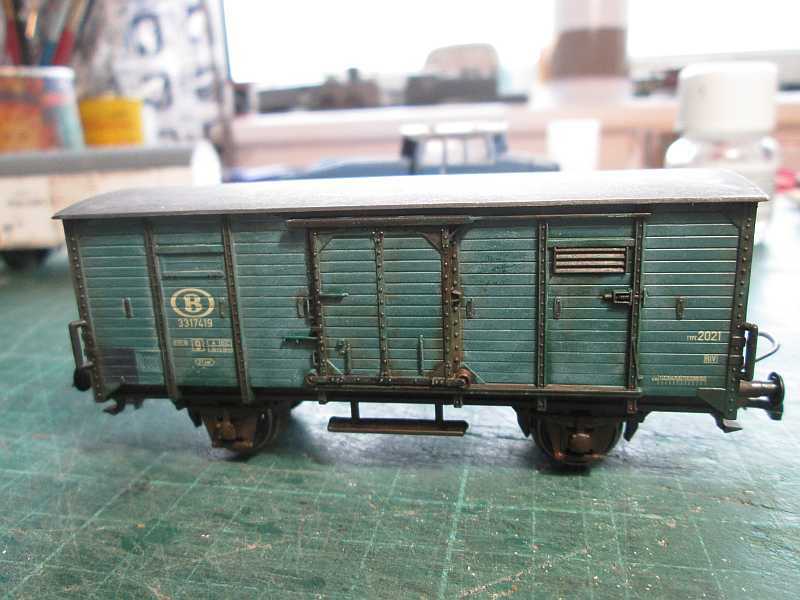 Having said that I managed to make some progress on the vans before my workbench was packed away. 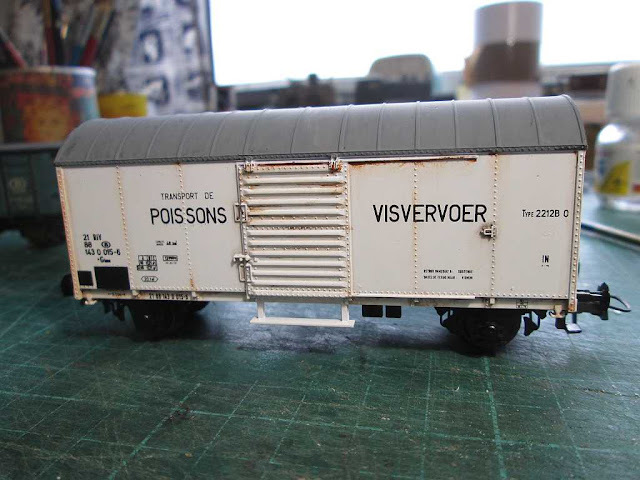 The second of the ferry vans was completed to the same stage as its companion, only requiring weathering to finish. 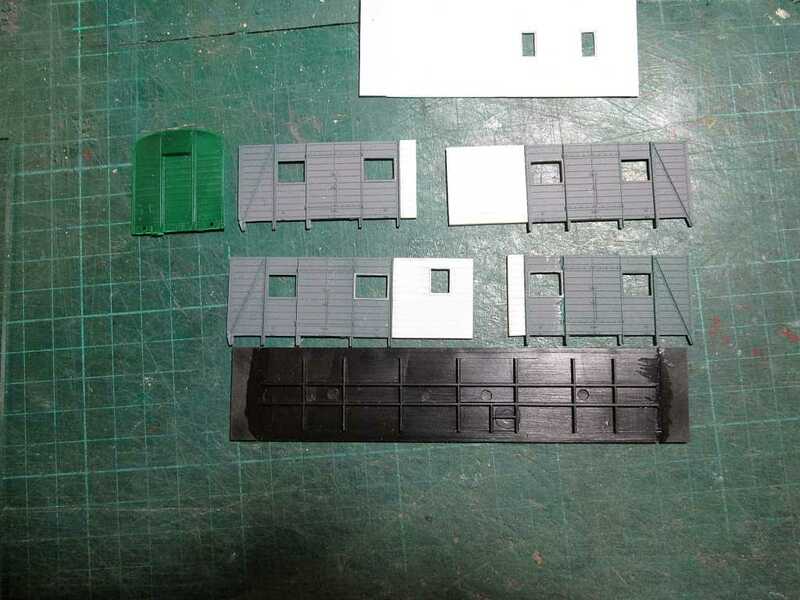 It was while I was picking out the yellow anchor points that I noticed that the far right ones were missing from the original Hornby mouldings so I fabricated the missing items from black plasticard taking dimensions from those that Hornby included. Also making progress was the modified kit to represent the night ferry brake van with the birdcage roof. In the end I bought a fresh kit from Parkside as it's much easier to work in the flat and for some resons the sides on my ready built model had started to bow outwards. 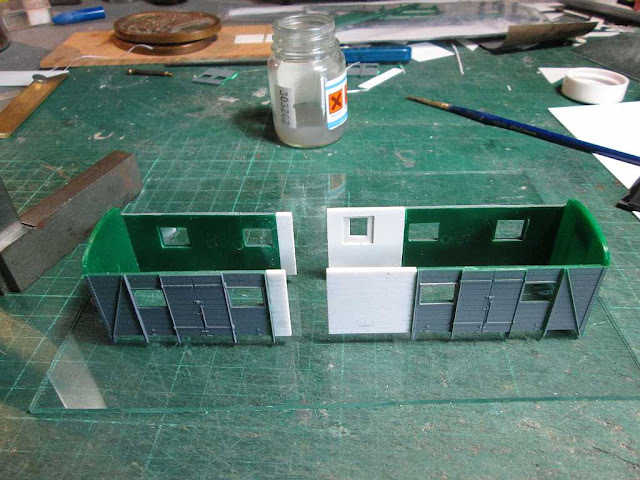 The photo sequence should illustrate the work done, the white parts being my scratchbuilt additions. 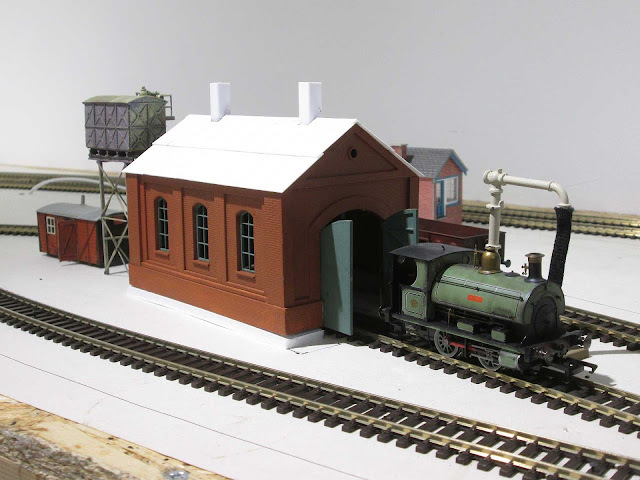 One crucial advantage of buying a fresh kit is that I could use the roof of the ropey ready built example to extend that of the fresh kit to match the longer length of the night ferry brake over the standard PMV.